Johnny Sauter is a racer’s racer, a 23-time race winner, 2016 champion, a future NASCAR Hall of Fame member and a tell it like it is, race car driver. In this interview, we talk everything racing including how Sauter got his start, his return to Thorsport Racing, the NASCAR schedule and recent rule changes, what race car part he would be and if he would retire now, would he be satisfied with his career? Necedah, Wisconsin is where you will find the famous racing name, the Sauter family. The Sauter name has been a big name in racing, just like any big name in racing. Tim Sauter, Johnny’s brother, and Jim Sauter, Johnny’s dad all made their mark in NASCAR by making starts in several series. Growing up, he was not your typical sports kid. He was always interested in racing from a very young age, like most race car drivers nowadays. Sauter did not spend time Friday nights watching high school football games or basketball games. Instead he was focused on racing and spending time with his family at the racetracks. The Wisconsin native talks about what peaked his interest in wanting to become a racecar driver. He recalls his first few memories of being at the racetrack at such a young age. He remembers being aggressive and people not being happy with it. Before his time in NASCAR, he competed in what is now the defunct ASA National Touring Series, where his first start came in 1998, by racing in seven races. The series was known for building drivers before competing nationally. He talks about how he started racing in ASA and why it led him to where he is today. With the ASA gone for several years now, Sauter thinks it could come back, but it would have to take the right people. With his involvement in ASA, Johnny didn’t make his first Truck Series start until 2003 driving the No. 9 Christopher Beckington machine. Sauter built his own truck and ran a few races the following year before it was too expensive. In 2005, he ran one race for Thorsport, which ultimately started Duke and Rhonda Thorson’s relationship with the team to where they are today. He returned to Thorsport Racing in 2009 to his first full season in the Truck Series. He talks about their relationship and why running for the team is so special. And if he is superstitious of his No. 13. He also explains if he is superstitious about driving the No. 13. When he is not racing in the Truck Series, he is racing and building his own late models. However, there are some tough times that come with it. Being back at Thorsport Racing means Matt Crafton, also a two-time champion, is his teammate again. The two have definitely shared a lot over the years and remain close friends. Sauter describes their relationship and how it helps the team of what they need. Throughout the years, he has competed off and on in the Xfinity and Cup Series driving for multiple people. The last few years, however, he has been in the Truck Series. He explains why the trucks are a perfect fit for him. Sauter also gives his thoughts on the schedule length to either keep it at 23 or have more or less races. In addition to talking about the schedule, Sauter explains where his favorite stop is. With Sauter and Crafton being the veterans of the series, more and more young drivers are coming up through the series just to get experience and move on to the next thing. “That’s a tough deal,” he continued. “Sports are getting tougher and tougher on when to move up. I don’t know who the next breakout star is. It depends where they are going and who they align with. I probably look at it a little more in depth from a experience stand point. The Truck Series has grown in status and has become quite popular among the fans from where it was 20 years ago. It’s quite possibly the best racing out of the three series. Sauter details his thoughts on what it looks like 20 years from now. With Sauter being around racing his entire life, it’s hard to imagine him doing anything else other than being a racecar driver. During the interview, Sauter had to think hard about what kind of racecar part he would be. He also remembers the 2010 Iowa race where he started fifth and finished second. Sauter also tells why you shouldn’t get caught up in the moment. If NASCAR had come to him for an opinion on what he could change rule wise, he explains that he doesn’t know what he would change. With being on the topic of rules, the 2016 champion gives his thoughts on what he thinks about NASCAR changing the rules so that if someone fails post-race inspection, they will be disqualified and lose the win. Almost every driver wishes they had a race they could do over again. Whether it’s a restart, a pit stop, whatever it is, a racecar driver always remembers. In this case, Sauter remembers the 2011 Texas race that ultimately cost him the championship that year. If there was to ever be an exhibition race that included legends such as Ron Hornaday, Todd Bodine, Jack Sprague, Mike Skinner, Ted Musgrave and himself included, he thinks he could win. He also said that maybe a race like that could draw fans. 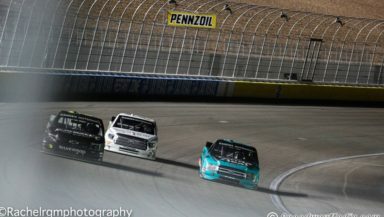 With the stage racing and Playoffs being implentend in the Truck Series, Sauter thinks it hasn’t really changed much in terms of the race aside from pit strategy. With the Truck Series not racing as much as the Cup and Xfinity Series, it gives guys like Sauter the opportunity to spend more time with their family and he’s a big fan of that. “You know, I’m a huge fan of dropping my kids off and picking them up every day,” he said. “If I’m not at Thorsport, I try to work on my super late model stuff. We are getting into that time of year, where I need to be working on that stuff. My biggest deal right now is working on this truck deal and learn my guys, and have them learn me, learn some stuff up here..
At some point in a driver’s career, they think about retirement. Sauter doesn’t know what that’s like, whether it’s this year or five years from now. One’s thing for sure, he won’t be around much if he is done racing. Kyle Busch has been in the news recently and receiving a lot of criticism for competing in both series. Sauter thinks it’s ridicoulous and people need to quit complaining about it. “It doesn’t bother me at all,” the Wisconsin native said. “They were saying some stat where out of my 23 wins, only six of them was when Kyle Busch was in the field. On any given day, if the opportunity presents itself, they’re beatable. They’re obviously good drivers and all that. I think people need to get off that complaining stuff, you know what I mean? Sauter continued to explain about comparisons in other sports. With having a best season of six wins last year, Sauter gives his prediction of how many wins he thinks he will have by the end of the 2019 season. In his Truck Series career, he has 247 starts over 16 years, 23 wins, a championship, 103 top fives, 159 top 10s and seven poles. The fierce competitor doesn’t look like he will be slowing down anytime soon. You can follow Johnny Sauter on Twitter.